Futurecaps follows Warren Buffet style of Investing principles. 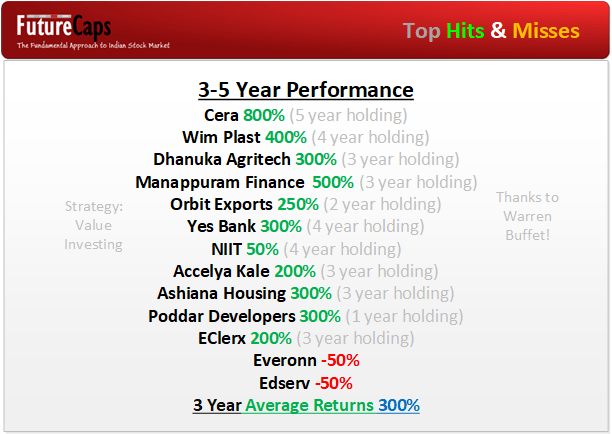 Here is the Past Performance of last 5 years. Prior to that we were running the website valuestocks.in which provided the following recommendations & their peak performance. There was a break in service due to SEBI restrictions. Right now in 2019 we are back with the required SEBI Certifications. You can visit our Testimonials page here. You can visit our Subscription Page here. ← Monthly SIP is the Best Option! This is music to the ears. Waiting like a hungry dog…… Frankly my dear, we dont give a damn, if you have a licence or not, we have already given you out vote of trust. Bhailog, it’s mid of 2016 and we still haven’t heard from u…is the certification still pending ? Yes, Cert Achieved. Waiting for next step.